Scribbles In the Sand........... My Desert Diary: These aren't my thoughts, they're my cat walking on the keyboard. These aren't my thoughts, they're my cat walking on the keyboard. I'm bleeding and I'm full of pokes. This is my cat, Isabella. 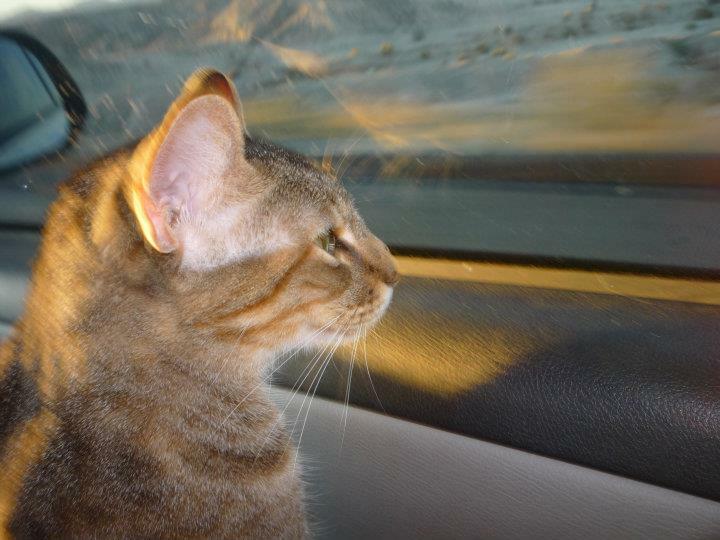 She is the only cat I've ever had who rides in the car, looking out the window and checking things out. Most cats I've had hide and wait for it to be over (or in the case of my cat, Smudge, cries, pees and poops all at once). But she's a traveler. We adopted her almost four years ago in Argentina from a young woman who didn't speak a word of English so she hilariously pantomimed all instructions to us about her litter box and deworming medication. It was even funnier because our Spanish wasn't that bad at the time so we understood her anyway. Wish my cat would be a traveler like Isabella! She weeps and wails all the way going and coming back from the vet. BTW, her predecessor's name was Isabella too! Funny post. mysister is the real cat lover. She has 6 with 1/2 of them with special needs. The cats don't travel so, I used to baby sit them. About the Spanish, I understand more than speak. It is funny when I understand what people are saying in the line at the grocery store. OOPS! that seceret is out.